The winners of the Standard Bank KZN Top Business Awards 2018 were announced at a gala dinner held at the Elangeni Maharani Hotel on the 21 June. The glamorous event was attended by many captains of industry and their invited guests from across the province. Imraan Noorbhai, Standard Bank KZN Provincial Head said, "Let us as Business KZN embrace these opportunities to create meaningful and constructive dialogue, dedicating ourselves to running successful businesses that create growth and opportunities, reducing unemployment and inequality and building a Province where all benefit from its rich resources, where people can live with dignity, harmony and mutual respect for each other." The annual awards, now in their twelfth year, celebrate achievements in the public and private business arena over the past year. 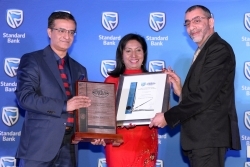 The prestigious Standard Bank KZN Top Business Leader's award is an honorary award given to a business person who has demonstrated exemplary business achievement, industry influence and is a true inspiration to others. The 2018 award was given to Imtiaz Sooliman the founder, director and chairman of Gift of the Givers, a disaster relief agency, which has been in existence for 26 years. Sooliman says that he is driven by his motto and that of the Gift of the Givers which is simple. The motto states: "Best Among People are those who Benefit Mankind". Thus far the Pietermaritzburg headquartered organisation has disbursed in excess of R2,1 billion in aid to needy individuals and communities. Sooliman also gave an inspiring key note address outlining his story and the various humanitarian initiatives in which the organisation is involved. The Standard Bank KZN Top Business industry sector awards focus on organisations' and companies' successes in relationship to the economic, environmental and social spheres in KwaZulu-Natal in both the public and private sectors. Factors such as brand and reputation, stakeholder relations and goodwill, environmental sustainability, social responsibility, and quality of governance are all considered in the formal judging process. The Standard Bank KZN Top Business Partnership award is annually given to a private and public partnership. This was awarded to eThekwini Municipality and its unit Invest Durban who recently coordinated an investment road show to the United Kingdom. The road show was noteworthy for being the biggest combined regional delegation of business and government ever to travel on an investment roadshow. The visit which focussed on Durban, KwaZulu-Natal's key catalytic projects, local businesses and the region's competitive advantages was met with much interest by investors. Cllr Sipho Kaunda, eThekwini Municipality's Economic Development and Planning Committee Chairperson attributed the interest, "to the opportunities the region has for both small and large investors. The 65+ B2B meetings concluded set a new record from which additional investments will flow into our economy." The Standard Bank KZN Top Business Top Brand is enthusiastically contested over several weeks, which sees much excitement. This award is awarded solely based on the results of an online public poll. The winner in 2018 was uShaka Marine World, in second place was Blue Security and third Boston City Campus & Business College. Two additional awards were given in the SMME and entrepreneur categories. eLan Property Group gave the SMME category award to Madunge Events and Projects. Walter Coughlan - Fair Food Company was given the Businessfit Entrepreneur Award. Grant Adlam publisher of the KZN Top Business congratulated all winners and finalists and thanked everyone for their efforts in making the evening a success. The KZN Top Business, which promotes the province of KwaZulu-Natal celebrated its twentieth edition in 2018.